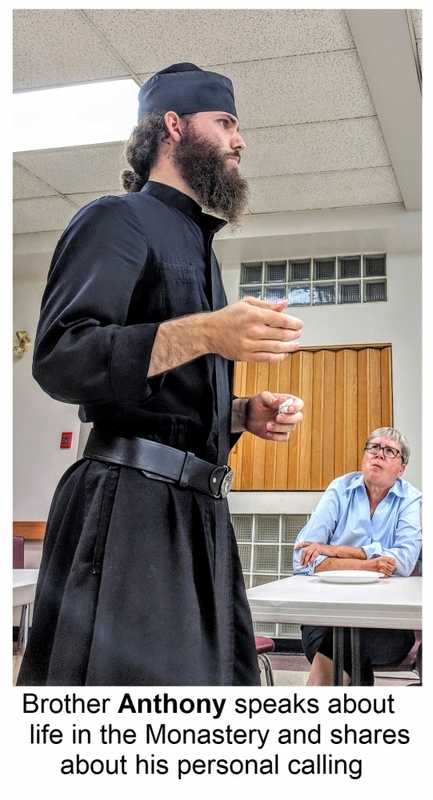 Hieromonk Deacon Paisiy and Brother Anthony from Holy Resurrection Monastery at St. Nazianz, Wisconsin, visited Holy Eucharist Parish in Winnipeg's East Kildonan. As part of the Parish's ongoing Centenary celebrations the parish is trying to hold many various events to commemorate its hundred years not only with memorials, but with a look to the future. One such event was the visit home of Deacon Paisiy (Paisius), who originally comes from Holy Eucharist, but his desire to live the Eastern Monastic life took him to Holy Resurrection Monastery in the U.S. where he is now a member. Father-Deacon Paisiy is preparing to receive his "tonsure" - full entry into the monastic life and the community - early in the new year. He was able, however, to travel with a fellow member of his monastic community, Brother Anthony, and return 'home' for a brief visit. 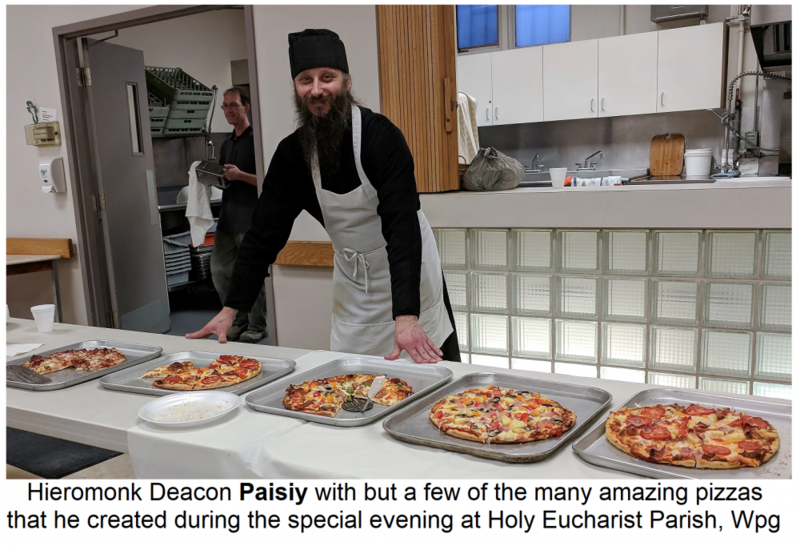 Some parishioners suggested that Deacon Paisiy, who, apparently, is known as a pizza-master (who knew!?) hold a pizza night while he's in town at the parish as part of our centenary celebrations. He agreed and it was decided appropriate to begin the evening with vespers. Parish Priest, Fr. Michael led the vespers, while Deacon Paisiy and Brother Anthony led the responses. A nice number of parishioners and guests gathered for the prayer and they all had texts and joined in. Aftwerward, everyone was invited downstairs and the pizza-making began. Although some people helped out, Deacon Paisiy was clearly in charge and knew what he was doing! Dough was pressed into pans and tomato sauce and toppings were spread on top. Almost in the blink of an eye, the first pizzas were in the oven. As the evening went on, guests were able to either help make the pizzas or call out their favourite toppings or favourite pizza and they were made to order. At on point, in between pizza bakes, Fr Michael invited Brother Anthony to addressed the gathering and speak about what Monastic life is all about and how it is lived at Holy Resurrection Monastery. Brother Anthony gave a fascinating presentation and even shared a bit about his own personal vocation journey. People were also able to ask questions that they had about life in the monastery. Many pizzas later, everyone had their fill and even had the chance to take a few slices home if they liked. 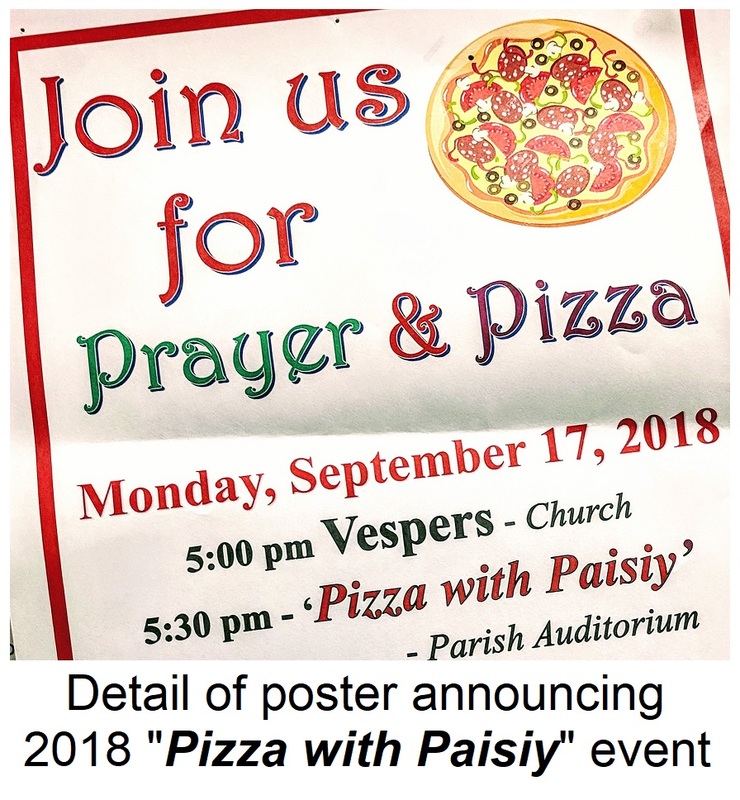 It was a rather impromptu event with posters and an announcement put in the bulletin the week before. Everyone that came though, had a very enjoyable prayerful, informative and delicious (and filling) experience. The good monks have since started their journey back to the monastery, but we are grateful for the blessing that they brought to our parish.